With only one button, all you have to do is press and hold to aim and release to fire at the desired target. Your prize will then pass through the prize hole if you win. 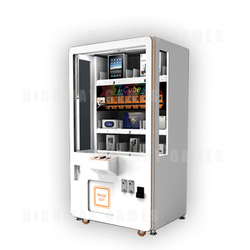 Sturdy, brightly lit, steel cabinet - based on iPhone design. LED lighting for charismatic look! Eye level play zone gives players confidence of winning. Anti-theft protection for each prize bin! Adjustable prize bins to hold various sized prizes! Each prize bin is adjustable for payout from 1-9999! Reliable and accurate payout setting by using stepping motor mechanism.